Today's card is one of those "I never knew I would make this" projects. It all started when I was killing time, waiting for a friend to finish up an appointment. There was a local craft store right next door so I went in just to window shop! As I walked by a rack of clear stamp sets , I heard this set cry out to me, a pathetic little mewling sound like something that might come from a sad and abandoned kitten. The set not only had stamps and sentiments, it had matching dies. I rarely use rubber stamps these days, but definitely prefer red rubber to clear polymer when I do use them, and haven't purchased any kind of rubber stamp in who-knows-how-long. But this one jumped on me and forced me to buy it, even though it had clear polymer stamps and wasn't on sale -- jumped on ME, the "I-only-buy-at-sales-or-with-a-discount-coupon-lady." Sketch is from The Outlawz, turned sideways. 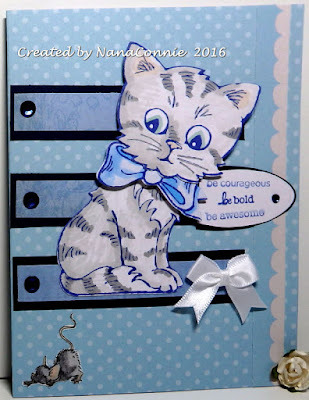 The kitten image is colored with my ProMarkers, then die cut with the dies from the set. (Stampendous) There are three separate pieces to the kitten and I adhered it with Pop Dots on the head and bow for a little dimension. The mouse is from Rick St. Dennis, also colored with ProMarkers, then hand cut (whew, what a chore that was!) The kitten's expression just called for something to be in that corner so I hunted up that perfect little mouse. 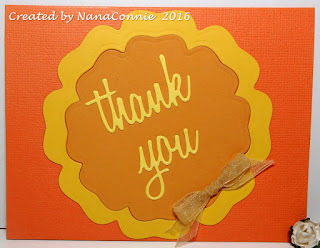 The sentiment is hand stamped with three tiny sentiment stamps from Stampotique (which have been in my collection forever), then die cut with an oval die from Spellbinders. I added gems for a bit of bling and a white, satin-ribbon bow. I thought this would make a perfect card of encouragement for a child. Good Friday Morning, friends. It's time for a new challenge at QKR Stampede. 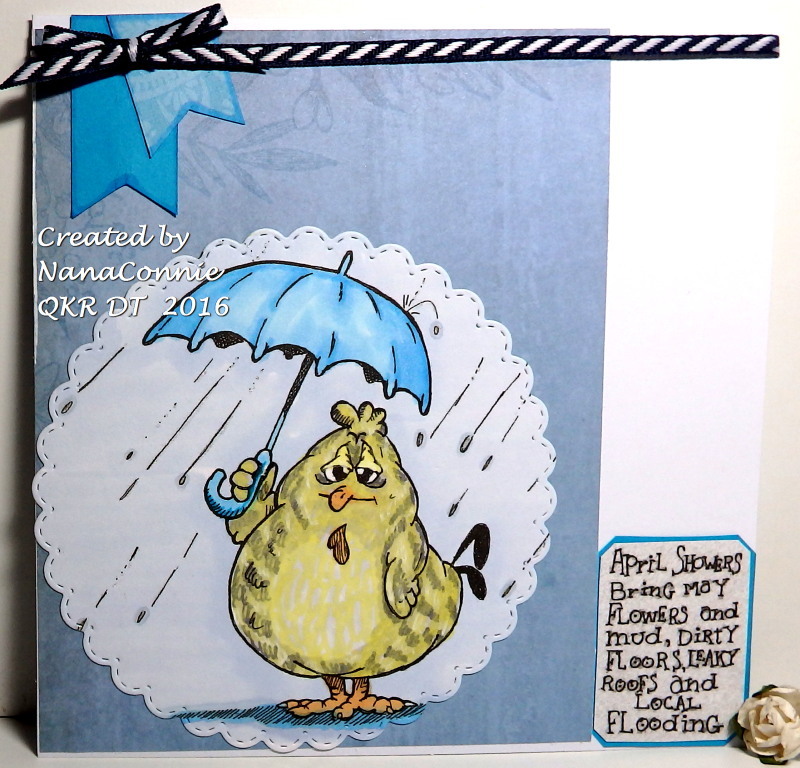 Our latest theme is "April Showers Bring May Flowers" so let's see something with raindrops, umbrellas, puddles or flowers, gardens, etc. 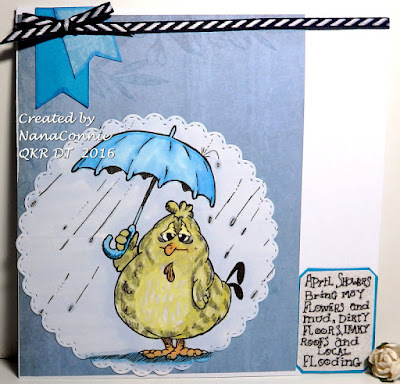 I used an image and a sentiment from QKR Stampede: Digi 24296 Chicken Little and Digi 14707 April Showers. and colors from Color Throwdown. 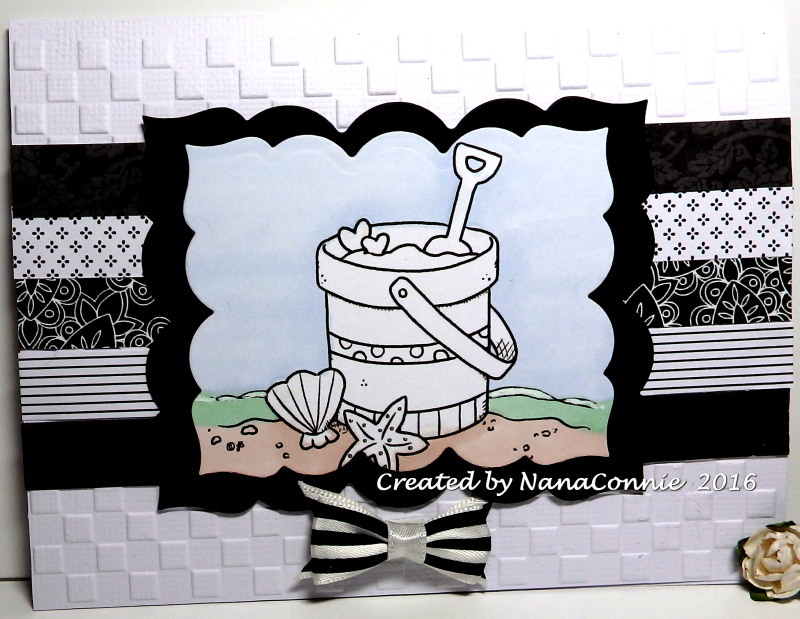 I started by coloring the image with my ProMarkers and then I cut it with a Stitched Scallop die from Memory Box. The blue background paper was in my stash of large scraps. I hand cut the two dovetail flag bits, one from CS and the other from dp. The striped ribbon is some which has been hiding in stash for far too long. 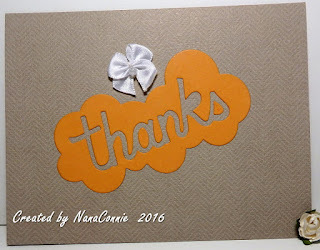 A dear blogging buddy included me in a list of friends she believes have been instrumental in support and inspiration, and I felt so honored by that. Today's card was made as a way of giving back to her the honor she bestowed. 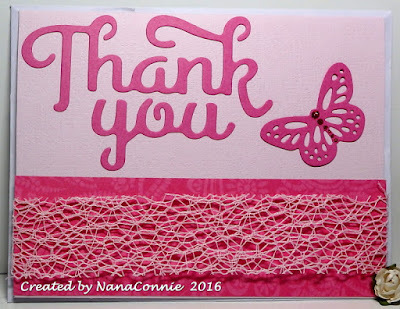 She was the primary person who encouraged me to continue my journey into card making back in the days when I was learning the most basic things about card designs. It's also because of her that I started blogging and she's the lady who has made all my blog mastheads with the adorable felines. Thanks so much, Donna! This card should be in your real life mailbox in just a few days. I used my ProMarkers to color the image and decided I wanted to stay with a monochromatic yellow combo in my overall design. 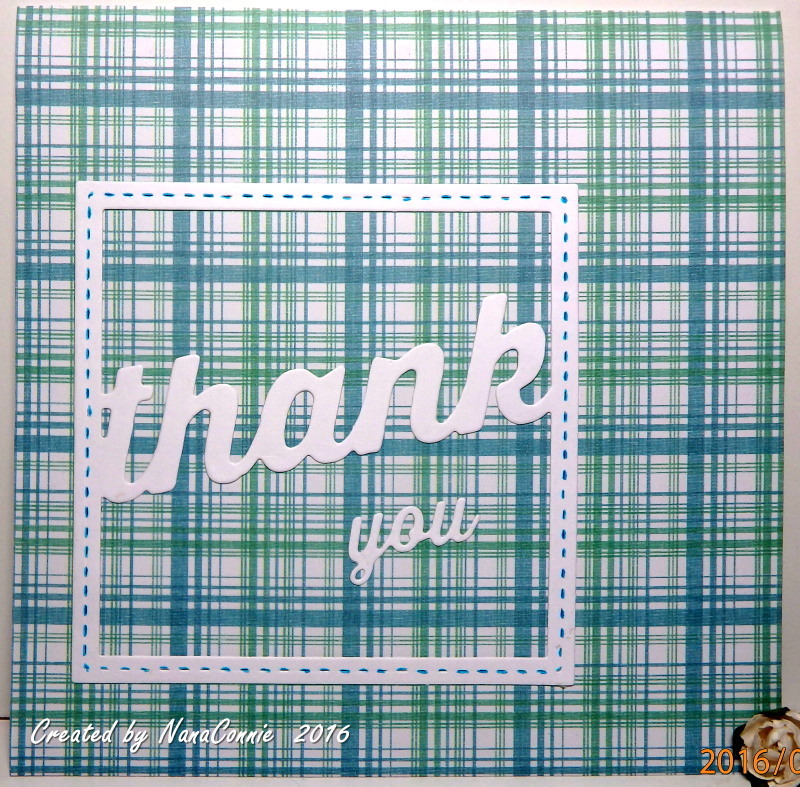 The image and the mat are both die cut but since the die is rectangle in shape, I had to cut once then move the die and cut a second time to get the square shape. I dug through my box of scraps and found 2 papers very close in color, even though one is a marbled design and the other very flowery. They must have come from the same paper stack originally, but I have no way of knowing since they were just small pieces in the scrap pile. I die cut one of the strips using that same die set. 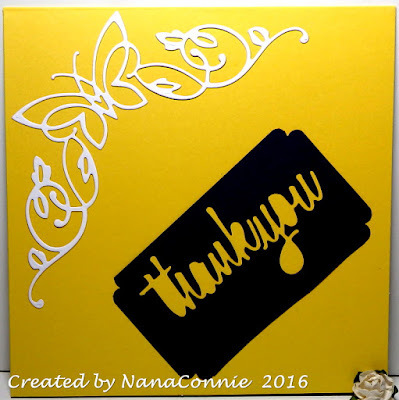 I decided to try putting everything onto a black card base and I really like how it made all the yellows pop. The sentiment is also from one of my From the Heart Stamps sets and I corner punched it before adhering it onto the dove-tail strip. Tuesday Throwdown starts a new challenge today with an "Anything Goes" theme and our sponsor is Newton's Nook. This stamp I used was already in my collection but it's also available as a digi freebie on their website. 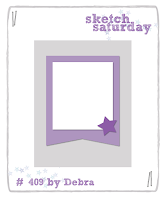 and the sketch from Sketch Saturday, rotated 1/2 halfway. The image is so delightfully CAS and I decided that I could add a few embellishments and still have a CAS design.. Although I love purples and purple-plus-something combos, I also love pink/brown, pink/gray, and pink/yellow combos. 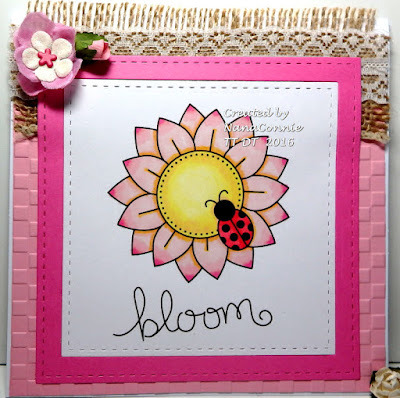 The image is colored with ProMarkers and then cut with a Cheery Lynn LG Silver Stitched Square die. I also cut the mat with the next larger size die from that set. It's my day to do the Designer Inspiration Post at MHK Designs and I hope everyone gets some kind of inspiration from this delicious card on which I used papers from the "Easter Flowers" digi paper set and an image from Mynn's lovely "Stencil in the Roses" set. After the fabulous release of five new sets this month, I wanted to use an older set which is one of my 'go to' sets for all kinds of occasions. I used a different printing technique than what I usually do and I really like the way it turned out. I selected my digital paper, printed it and then put that sheet of paper back into the printer tray. 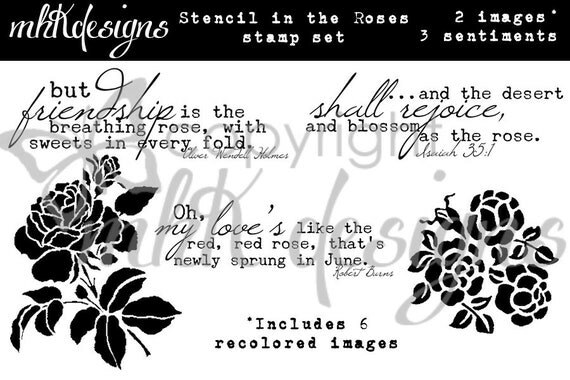 Then I went back, selected the rose image and printed it onto the original sheet of printed paper. Didn't that make a spectacular silhouette? 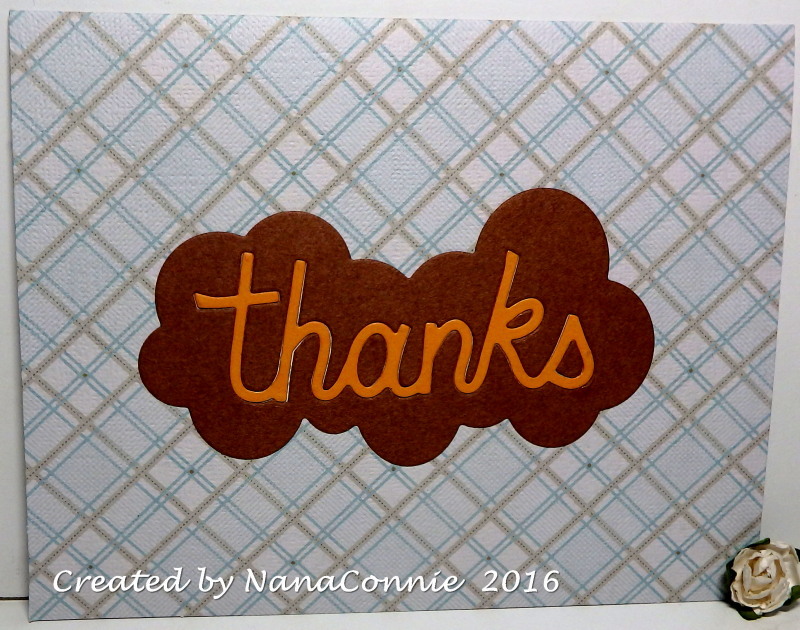 I trimmed the paper to size, turned it slightly on an angle, then trimmed off the corners which overlapped the edges of the card. I added one bit of black lace before mounting everything onto a lavender card front. 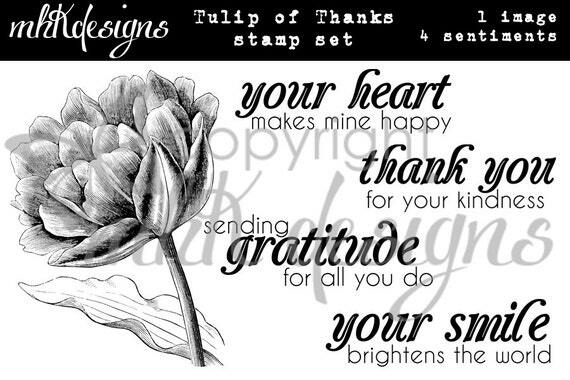 I printed the sentiment ("Tulip of Thanks" set) separately, cut it by hand, and adhered it last. 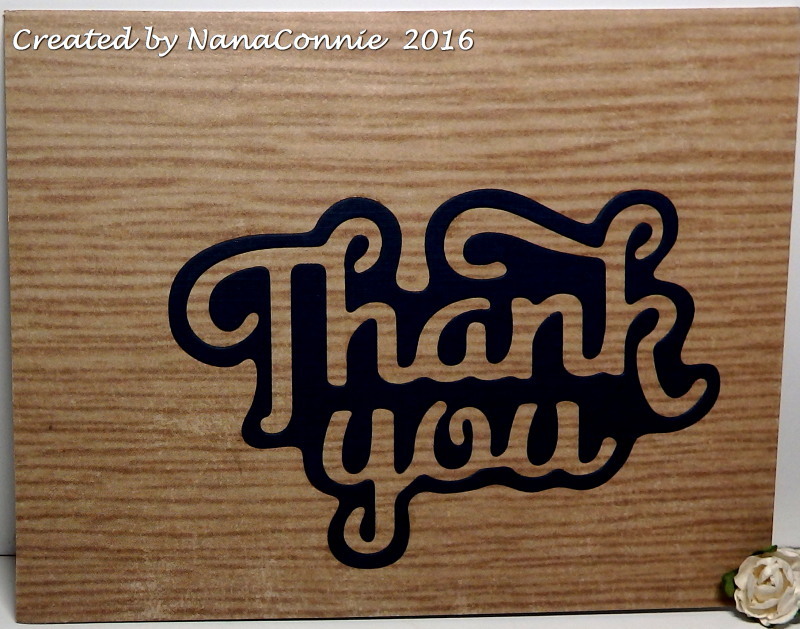 If you follow my blog or even visit regularly, you know that I'm in the process of making 45 "Thank You" cards at the request of my daughter, who is President of the Parent/Teacher group at my grandson's grade school this year. The 'Parent' side of the group is putting on a recognition luncheon to honor all the teachers on May 6th. Here are some more cards to share with you today. I've listed the challenges I'm entering underneath each card. This is going to be a really fast post to day -- I have a jammed packed day ahead. The image is by Fabrika Fantasy and I'm playing along in the challenge on their FB page. I used the sketch from Outlawz Sketch challenge, adjusted so that I could maximize the impact of the castle. 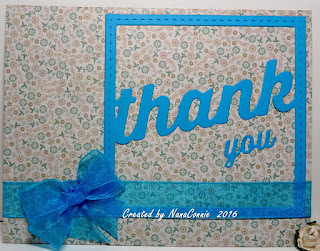 The background is scrapbook paper which I scanned, reduced to fit the card size, and then printed. At first, I wasn't sure how those would work when coloring an image but once I picked up the ProMarkers and started, everything just flowed. They are a great combo! Unfortunately, my slate brown has a reddish tone to it in the photo but it actually is a pretty close match to the inspiration photo color. Here's my result using Digi 13408 "Just Hangin' " and Digi 13411 "Hangin' " for the sentiment. 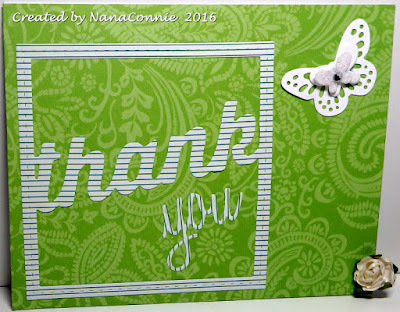 The image and mat plus the sentiment and its mat are all cut with Spellbinders dies. 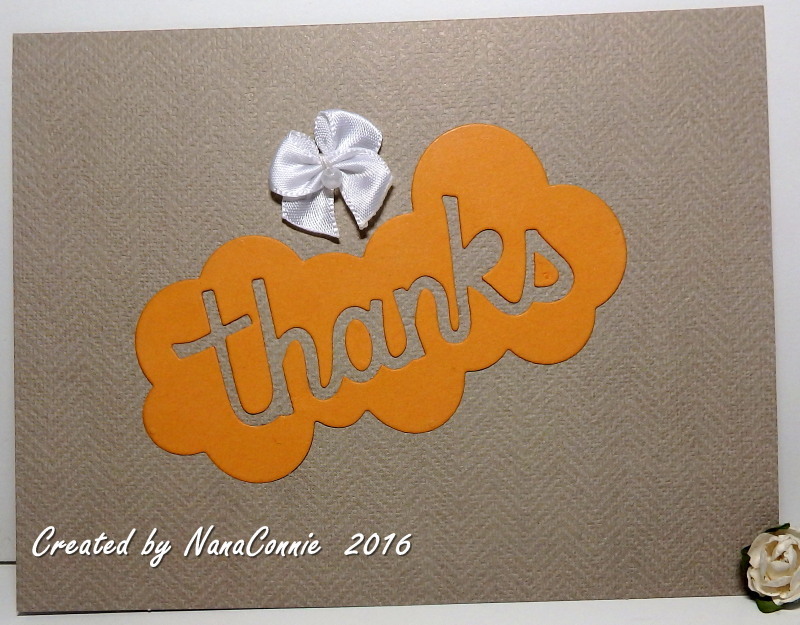 I used a Swiss Dot embossing folder on the gray CS. I wish it showed in the photo but the black CS is also embossed with a honeycomb folder. The ribbon has a diamond pattern in it and all three of those things give some great texture. The bow is 'dyed' with ProMarkers and again, looks reddish in the photo but is actually more slate brown. 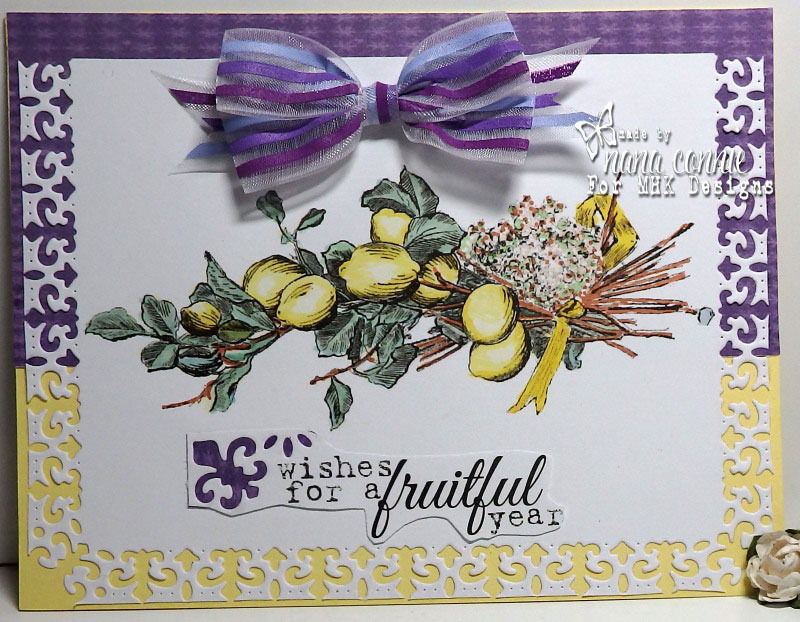 As you can see, I chose to go with the Anything Goes since I'm using both an image and a sentiment from the MHK Designs Fruit Borders set. 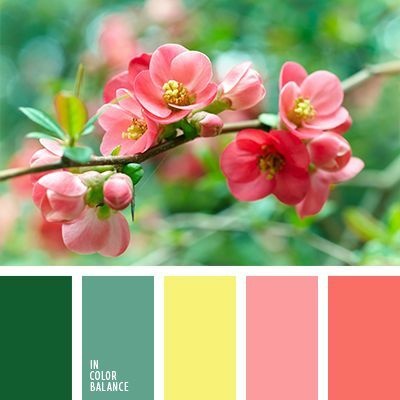 Still, I did manage to use a botanical image and a couple of the colors in the inspiration photo. 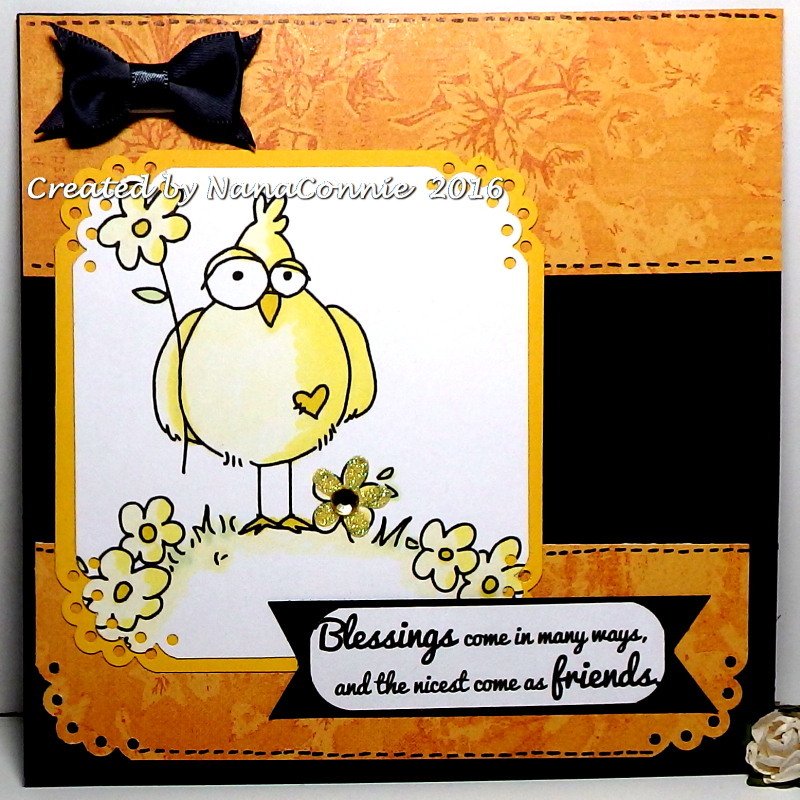 The image is colored with Copics this time, then die cut along one side with a Spellbinders Scalloped Borders Petite die. 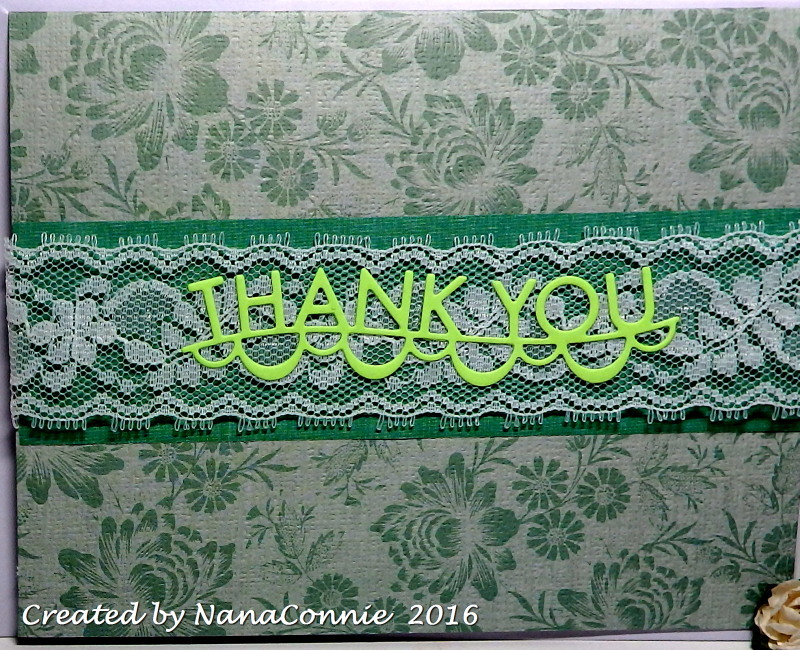 I cut two more border pieces from yellow and green CS and layered all the borders together for a 3-in-a-row look. I also border cut the sentiment and layered it on top. I gathered up a few of the 'dots' which fell out of the holes along the borders and glued them to the sentiment piece, then added the strings of pearls for embellishment. At that point, it seemed finished so I resisted the urge to smother it with flowers or bows or glittery additions. 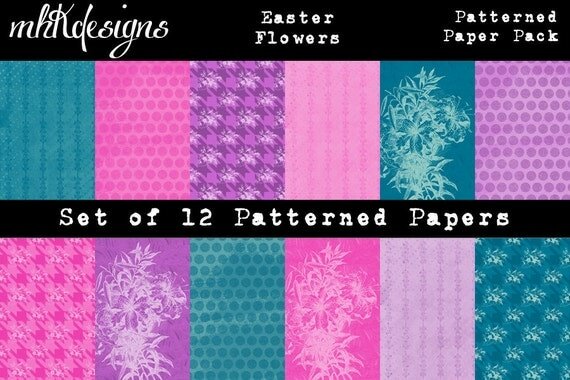 It's Wednesday and time for another New Release set from MHK Designs. 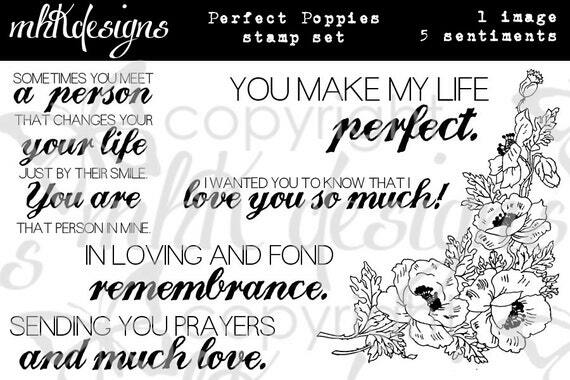 Today we're focusing on "Perfect Poppies" and I fell in love with this set the minute I saw it! You can see a photo of the entire set at the end of this post or by clicking on this link. I love how this card developed. I had no idea where it was going when I started. It's colored with a combination of ProMarkers and chalk markers. 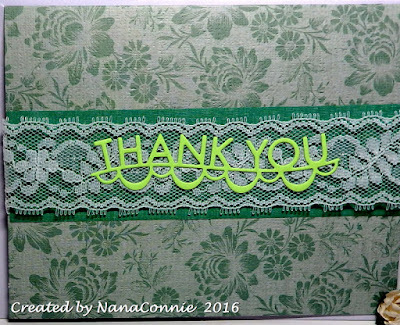 I started to fussy cut the image and then used a doily die from Cheery Lynn to take a scalloped 'bite' out of one corner. 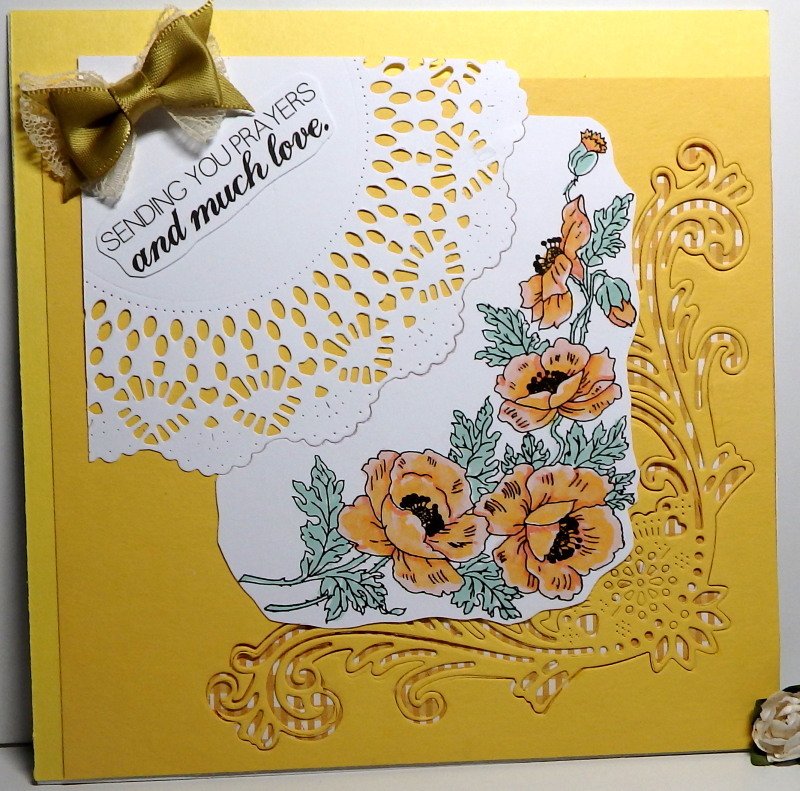 I used 1/4 of the doily to make the upper corner and used a Cheery Lynn corner scroll die to cut the lower corner of a scrap piece of golden harvest CS. I backed that scroll with dp from the MHK Designs "Going Gingham in Brights" set, and then inlaid the scroll piece back into the CS from which it was cut, letting the dp show through. Both the doily and the scroll are embossed, as is the gingham dp. 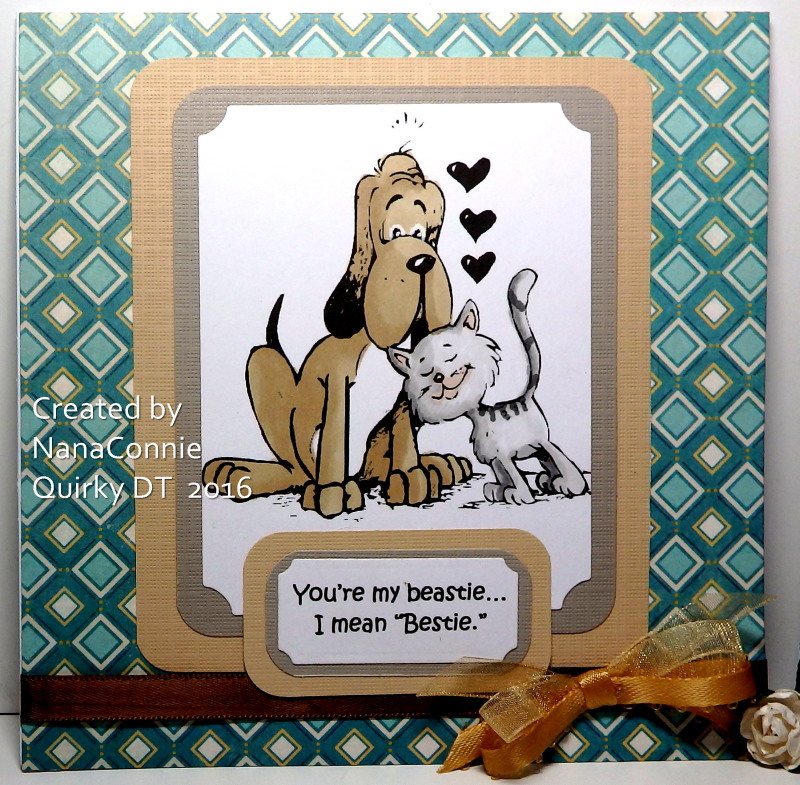 instead of a vertical one - From the Heart Stamps. I colored the sky, water, and sand with my ProMarkers and was about to start on the pail when I realized how much I liked it as a black and white line drawing. That led me to think about doing the card in all black and white and that's the end result. 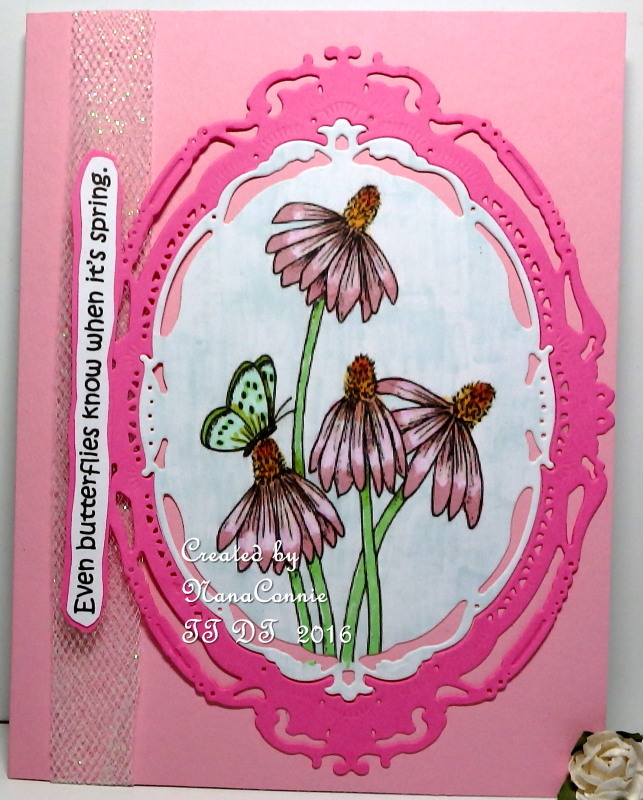 Die cuts by Spellbinders, embossing with a Cuttlebug folder, and bow done with striped ribbon from my stash. 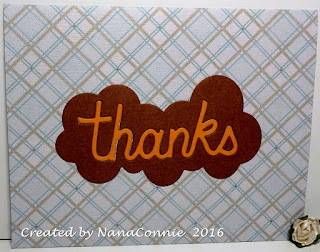 I'm working on the next batch of Thank You cards for the parent volunteers of the PTC to give to all the teachers at my grandson's school. My daughter is the group President this year and has asked me to make 45 cards for the luncheon given by the parents to honor all the teachers at the end of the school year. I finished the first dozen a couple of weeks ago, posted a photo of one of them, forgot to photograph the rest of them before giving them to my daughter, and now I've started on the next batch. All are very CAS and each one is done with some kind of die cut. I used dies from Memory Box, Die-namics, and die-Mensions. Within the group of teachers there are five men and the rest are women so this time I focused on making sure there were some masculine cards among them. I had already done two other masculine cards in the earlier batch. If you're looking for my MHK Designs post, please click here. but the only pale pink is on the cat's ears and mouth. 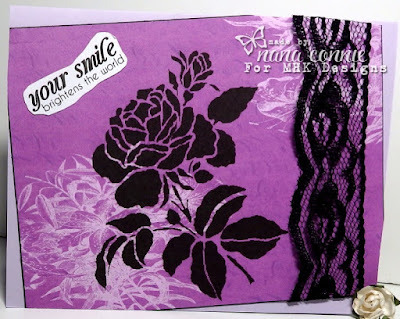 It's finally here -- the new 5-day-long release from MHK Designs! Be sure to check out the MHK Designs blog to see all the new sets, starting with yesterday's post. 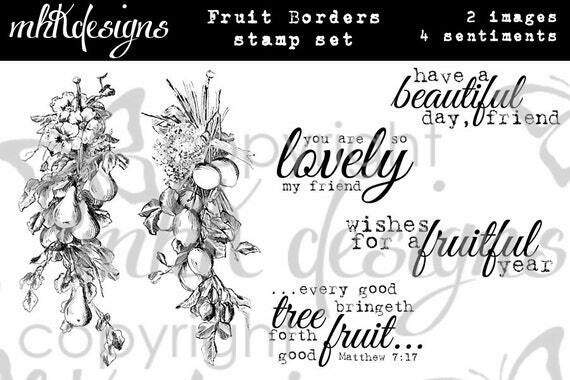 Today we're celebrating the "Fruit Borders" set and I love the images as well as the sentiments in this one. 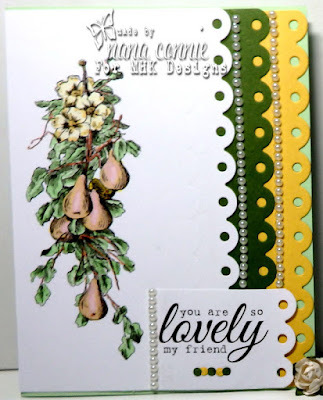 I've done a card using the Lemons but there is also an image with lovely pears which I'll use as soon as possible. :-D I'll add a photo of the set at the bottom of this post. I colored with a combination of chalks and ProMarkers and then die cut the image. 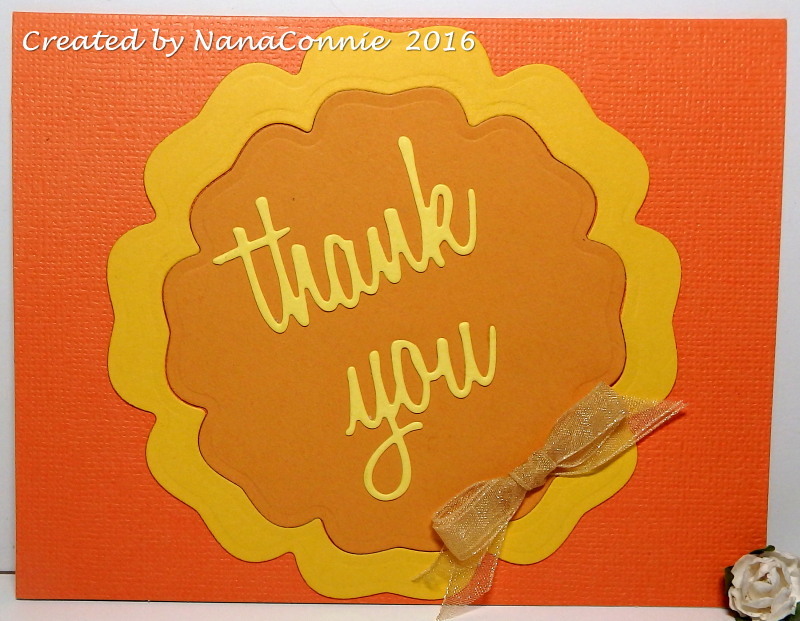 The die cuts are Cheery Lynn, including the one on the sentiment. 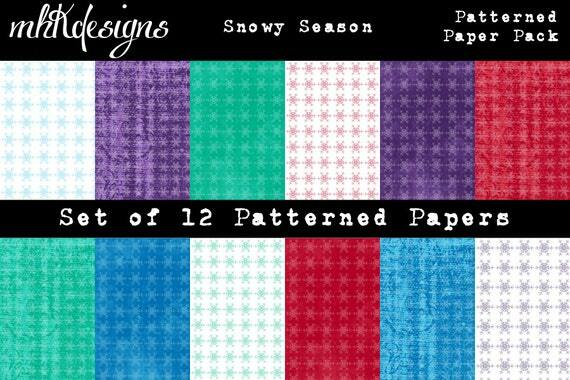 The purple background paper is also from a digital paper set by MHK Designs called "Snowy Season." The ribbon is one of my favorites from Really Reasonable Ribbon. Can you tell that I love purple? And my favorite color combo is purple and anything! Ok, ok, purple and yellow go so well together that I tend to use that combo a lot. 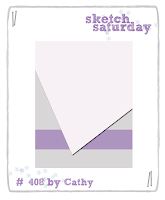 I took my colors from the challenge at Two Paper Divas. This is one more card which uses up scraps that were in the basket. I used my ProMarkers to color the image and cut it with oval dies by QuicKutz. The sentiment piece is cut with a Stitched Square die from Memory Box and the swirl is a Cheery Lynn corner die, with one side of the corner trimmed off. The background piece has been dry embossed and all three ribbons came from the scrap bin. 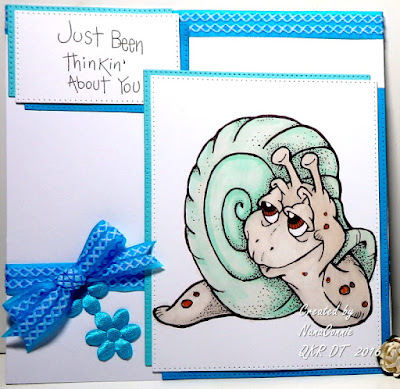 Our newest challenge theme at QKR Stampede this week is "Snail Mail" and we want to see cards with either a snail or a mail connection. 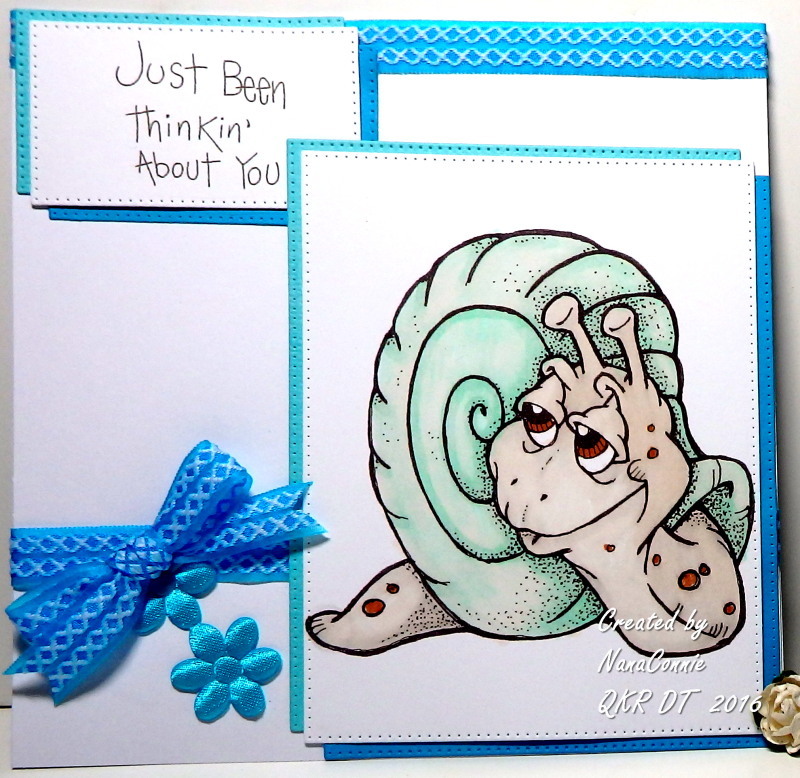 I've done a "Thinking of You" card with one of the most delightfully fun snails I've ever seen (Digi 16809 "Happy Snail" and Digi 11205 "Been Thinkin." 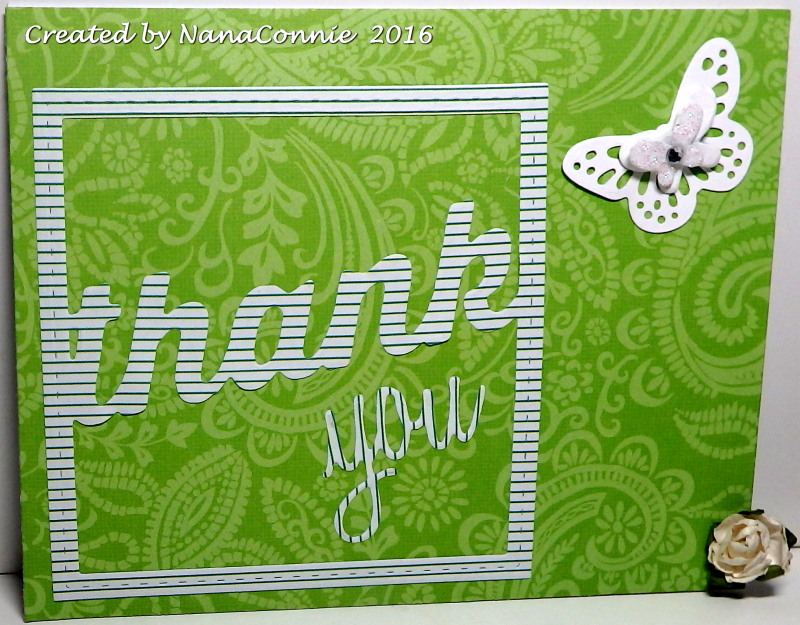 Everything on this card came from the scrap stash including the white CS on which the image and sentiment were printed. I used my ProMarkers (my 'go to' medium for coloring) on the image and then dug out my rectangle, pinpoint dies (Memory Box) to cut them and the double mats. The ribbon may have come from Really Reasonable Ribbon but since those are scrap pieces, I can't be sure. The blue flowers are also ribbon scraps. I'm finally playing in the Progressive Challenge at ArtbyMiran. I've intended to do that each month for at least 4 months and now I'm actually doing it instead of just saying I will. 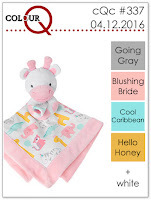 :-D I bought the image for this month, which is adorable, and now I'll get the one for next month as a freebie. although mine is a bit more CAS. The image is colored with ProMarkers, plus a bit of glitter on her wings. 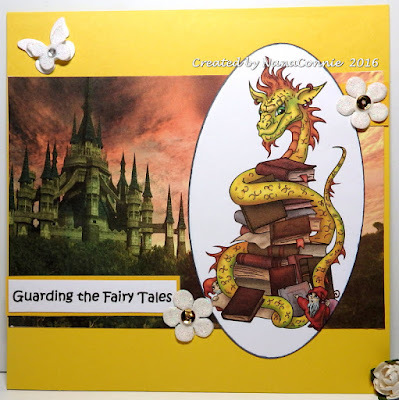 I cut the finished image with a die from Spellbinders. 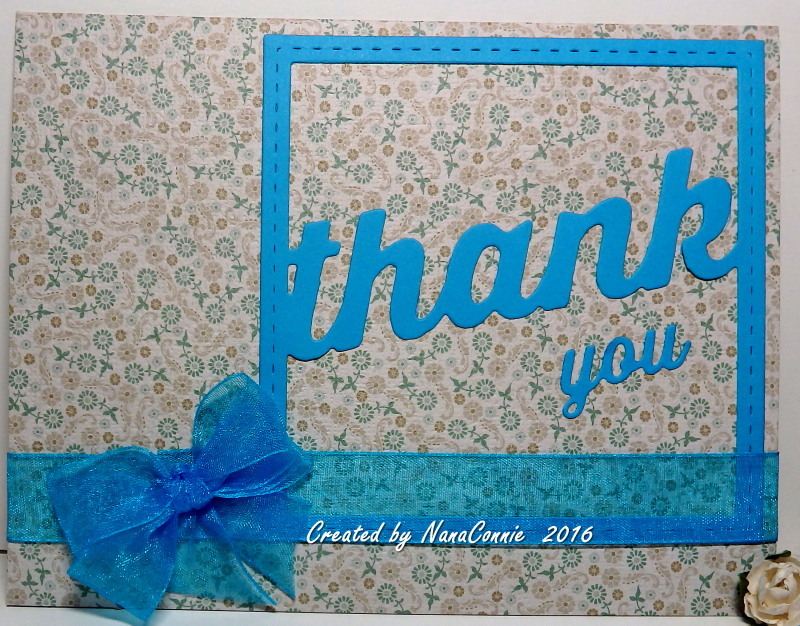 The turquoise mat is cut with a Cheery Lynn die and the sentiment is cut with an oval die from QuickKutz. The bow is handmade using wide, sheer ribbon from my stash. 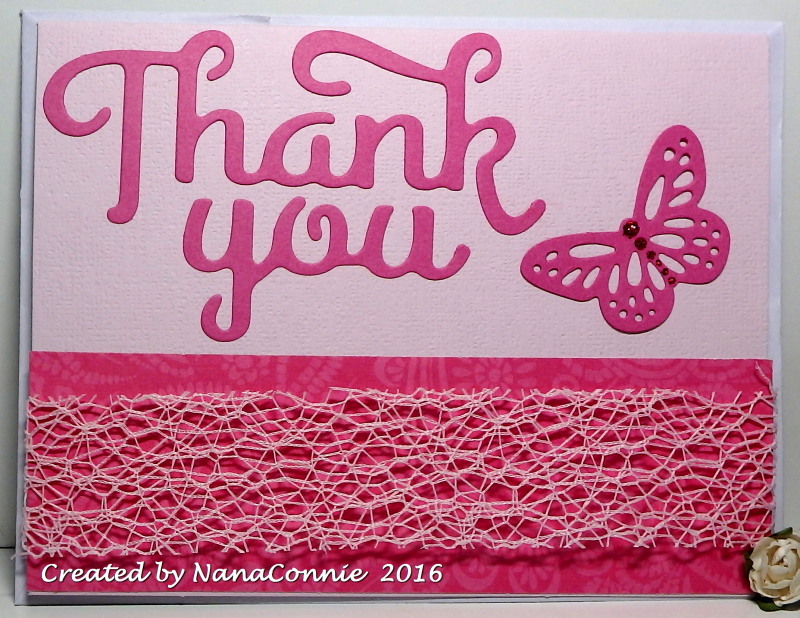 I really love how simple this card design is even though it has a fancy, frilly feel to it. I don't know how many of you really expect to sunbathe in April but it sure isn't happening in most of the country out my way. 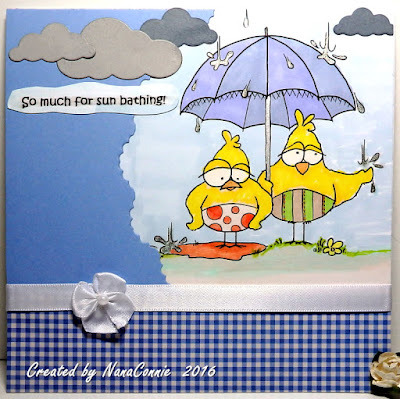 I love this Birdbrain image by From the Heart Stamps and I followed their latest sketch to make the card. 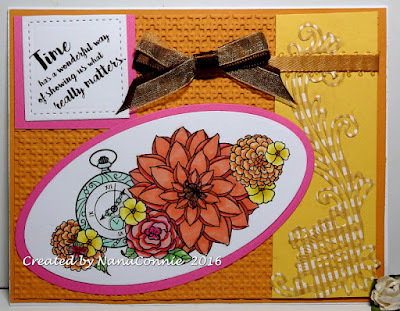 I used my ProMarkers to color the image but instead of die cutting it as I usually do, I used a leftover negative from a Cheery Lynn doily die to make the curved piece. That's layered on top of the image piece. 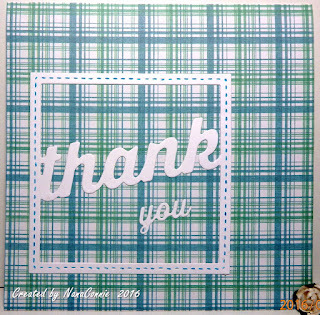 I also die cut some clouds (Memory Box) and then added gingham dp. Those all came from the scrapbox on my table. The ribbon is white satin from my stash and I made the bow using that same ribbon. I had such a great time making this DT card for the newest challenge starting today at Tuesday Throwdown. 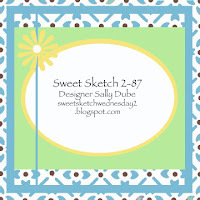 Our theme is "Use Die Cuts" and our fabulous sponsor is Sweet n Sassy. I'm using an image called "Coneflowers and Butterfly."